Tuesday's communications glitch between Phoenix and the Mars Recon Orbiter is resolved, Phoenix Project Manager Barry Goldstein today reporters at today's press briefing. Engineers designed Phoenix to use the two NASA satellites orbiting Mars as relay stations to send and receive data and commands with mission controllers. That relay link failed Tuesday morning when MRO experienced a radio transmission malfunction just as it was to send Phoenix its do-list for the day. 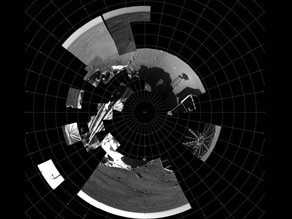 The evening transmission went off without a hitch - but, while they sort out exactly what happened with MRO, project managers are going to use the other orbiter, Mars Odyssey, to do much of the communications heavy-lifting. Both satellites make at least two good passes over Phoenix every day, so the impact on the mission should be minimal. In the mean time, the team is testing out Phoenix's robotic arm today and tomorrow, and if all goes well they'll start digging operations early next week. Phoenix is designed to dig down into the Martian dirt to scoop up soil and ice. The lander is equipped with a suite of instruments designed to look for organic chemicals frozen in that permafrost layer that may indicate whether or not Mars was once an hospitable place for life to have existed. On Sunday, a few hours after the checkered flag signals the winner of the Indianapolis 500, a much, much longer trip will conclude: After a nine-month, roundabout 422 million mile journey from Earth, NASA's Phoenix Mars Lander will take aim at a site near the Martian North Pole. And like the fans at Indy, everyone will be waiting to see if there's a wreck. 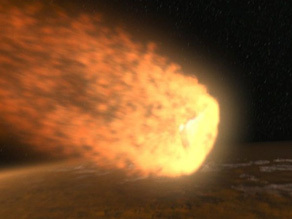 Phoenix will enter the Martian atmosphere at 12,500 miles an hour. After deploying parachutes and firing thrusters, and at a speed of about 5.4 miles an hour, it will touch down at about 7:38pm Eastern Time. Or so NASA hopes. Mars landing craft have a roughly 50-50 success rate since the twin Viking landers touched down 32 years ago. With a communications delay of about 15 minutes, we'll get our first info on the landing status at 7:53pm ET. CNN's Miles O'Brien will cover the landing live in a special hour broadcast beginning at 7pm ET. CNN International will carry the broadcast worldwide, featuring Miles's international counterpart, Kilometers O'Brien (sorry, it's an old joke around here......). Later in the evening, around the 10pm hour, we hope to show the first images from Phoenix. Unlike the spectacularly successful Mars Rovers, Spirit and Opportunity, Phoenix is not a mobile craft. It's a digger. Equipped with a small backhoe, Phoenix will dig into the Martian tundra in search of evidence of water, or other clues of past life on the Red Planet. 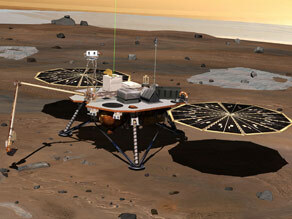 Its predecessor in Martian Polar research, the Mars Polar Lander, was lost on landing in 1999. Miles and CNN producers Kate Tobin and Alex Walker will broadcast the hour from NASA's Jet Propulsion Lab in Pasadena, California, mission control for the landing. They'll blog here to keep you updated - including after that tense moment at 7:53pm, when we learn whether a team of scientists and engineers will see years of work turn into a smashing success, or a smashup. Next Saturday, the space scene shifts to the Kennedy Space Center, where the Shuttle Discovery is set to launch at 5:02pm ET on a mission to install a Japanese-built lab on the International Space Station, and to swap out ISS crew members. Miles will be live from KSC for the launch as well. Where is it, you might ask??? Some astronomers say Mars, others claim it's Jupiter's moon Europa, and still others tout Titan, one of Saturn's satellites. But recently a new candidate has entered the field: Saturn's moon Enceladus. That's pronounced "in-SELL-uh-duss." 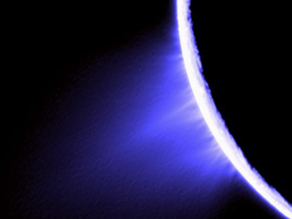 Two years ago the Cassini spacecraft, which is currently studying Saturn and its moons, flew by Enceladus and captured images and data showing Yellowstone-like geysers containing water erupting from the south pole. 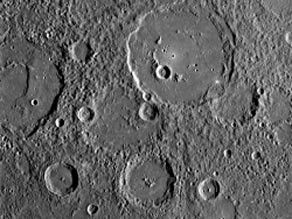 That, in turn, suggested pockets of liquid water, maybe even an ocean, may be lurking very near the surface. 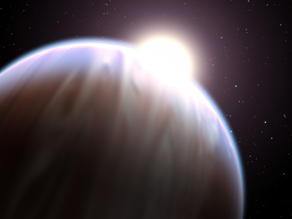 And, as any good astrobiology buff will tell you, wet places in the solar system will be the best places to look for extra-terrestrial microbial life. While there was no smoking gun, it sure got a lot of scientists' attention. 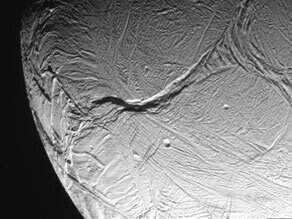 And Enceladus shot to the top of the list of places we might want to know a lot more about. 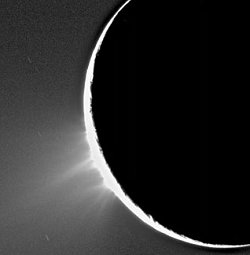 On Wednesday, Cassini will make its closest flyby ever of Enceladus, flying just 30 miles above the moon's surface, eventually passing directly over that south polar plume. It is one a series of Enceladus flybys that Cassini will execute this year, and it will be the closest yet to any object in the Saturn system. 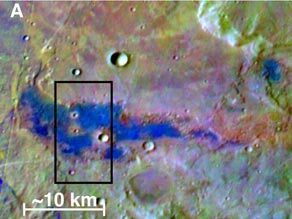 Instruments aboard the spacecraft will be able to determine what sort of other chemicals are in the geyser spray...which should help planetary scientists better figure out what's going on with this intriguing moon.